Abstract: This article addresses some key areas relating to care leaver’s transitions from residential care. These include the connection between beginnings and endings as well as misconceptions around terminology, including the usage of the term ‘independence’ for care leavers with ‘interdependence’ being identified as more appropriate. The debilitating impact of loneliness is also explored. Transition processes with reference to Bridges Model of Transition (2004) and the misconceptions associated with the usage of the term ‘care leavers’ are considered within what are identified as residualised residential services. It is proposed that the term ‘care losers’ is more accurate for these children with ‘care seekers’ being identified as a more acceptable term. The impact of stress on care seekers is identified where non-conforming behaviours are seen as symptoms of the overarching malaise of stress. This is further explored within an examination of focal theory together with the potential for healthy adolescent psychological development. T.S Eliot’s verse resonates within residential care and life today as much as when he wrote it. Both comprise transitions of intertwined beginnings and endings as we move along the continuum of life, transitioning between locations, contexts, generational groupings, relationships, life-stages of physical, emotional, spiritual and mental wellbeing, and dependence/independence/interdependence. This paper addresses some key areas relating to care leavers’ transitions from residential care: independence and interdependence, loneliness, stress and the less recognised, but equally relevant, focal theory of adolescence. The conception of independence itself can be confusing and benefits from a qualification of its intended meaning. What is the individual becoming independent from? Is it the residential or foster home – in which case the appropriate qualification might be independent living arrangements or independent accommodation? Or is it independent from Child and Family Services and/or the state that is the goal, and here the broadest and unqualified interpretation of independence might be seen to support such a position? Does any child become truly independent of their family if they move out of the family home to live in independent accommodation when, in 2014, so few have the means to do this before their mid- to late-twenties? American terminology is notable with regard to leaving care. There the leaving care process is referred to as the emancipation of young people. This has specific connotations of freedom and oppression (couched as protection) with arguably an implicit validation for the separation between oppression (from state care and therefore ongoing state support) and newfound freedom. The use of language can be of profound importance in social care and social policy (Hartman, 1991) and in Ireland, The Ryan Report (2009) can be commended on its referencing to aftercare as a vital service to assist care leavers in the transition to independent living, rather than merely stating independence. However, the addition of the word arrangements, thereby encompassing the pluralistic and interdependent dimensions implicit in such settings, might have been more appropriate. Bullock et al., (2006, p. 17) make the well-founded point that “The withdrawal of support, and sometimes the loss of a home, produce a new set of problems for young people that are often glossed over in euphemistic talk about independent living”. Clearly, living in independent accommodation is a very different thing from being totally independent of or from whatever support may be needed to aid the person to sustain themselves. Research by Dima & Skeghill, (2011) and Anghel, (2011) utilising the Bridges (2004) model, has identified that transition is composed of two distinct processes – the physical and the psychological, and has three distinct stages – endings, a neutral zone and new beginnings. What I have learned in regard to transitioning young people from one service to another is that ideally, the levels of support in the new placement need to be kept the same as in the one being transitioned from. This allows the time and space for young people to process the first two stages. This is easily conceptualised with an analogy that we all encounter daily when using doors between rooms or spaces at different levels. Building regulations require that when you step through a doorway you step across the door saddle onto a step at the same height so that both feet, either side of the door saddle, are at the same level. Then you may take a step down. If this was not the case and you stepped through a door to a lower level it is quite possible that you might fall and thus building regulations – and common sense – prohibit this. Similarly, when transitioning between placements it is only when the step encompassing the first two stages of transition has been accomplished that the levels of support can be reduced appropriately for the new setting in the new beginnings stage. This is especially important when dealing with Step-Down type services. 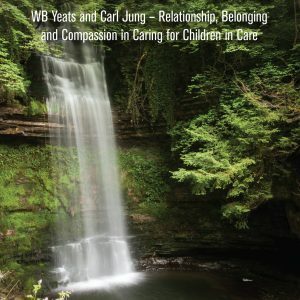 There is more than one step within a transition and the one least allowed for in leaving care is the neutral stage, where the opportunity to ‘space out’ within what anthropologists term the ‘liminal state’ provides a time for freedom, exploration, reflection, risk-taking and identity search (Stein, 2012). Whilst the transition process can allow for co-existence of the beginning and ending states, for example, we all have the inner child co-existing with our adult self and we cannot exist in both simultaneously. We must be one or the other at any single moment in time. We may retain the potential for both but there are strong elements of separation, loss and acquisition inherent within the transition process. The leaving behind of our former position is necessary in order to make room to acquire our new state. This holds particular significance for care leavers when we consider the aforementioned importance of the use of language. Here, the term ‘care leavers’ can be seen to be misleading for children leaving residential care who, for a range of reasons associated primarily with the residualisation of residential care (Smith, 2009) within many jurisdictions, often receive the least aftercare support (Fenton, 2014). For these care leavers it is the care that leaves them, whether they are ready or not, thus making the term ‘care leavers’ misleading and in reality ‘care losers’ more accurate. The term ‘care leavers’ implies it is the young people who possess the agency in the leaving event. They do not. For them, care is lost but their needs and vulnerability remain and are, in fact, multiplied and magnified by this loss of care. They must seek the essential resources, formerly available to them as care, to meet their needs, which renders them ‘care seekers’ or ‘support seekers’. Aftercare for these young people really means after care has gone, posing the question – what and who is left after care is gone? Considered from this perspective it can be seen that the inability to ‘acquire’ the new state following the loss of the old, consigns the care seeker to what Ward (2002) terms the ‘betwixt and between’ state, neither one nor the other. They are ‘transitionally-blocked’ and therefore unable to progress developmentally. This perspective also reveals the potential role that loss, including the anticipation of loss, plays in the care leaving process. This is in addition to the role of the compound concept of stress in transitions. Focal theory offers valuable perspectives on adolescent psychological development and is an integrated theory of adolescent development founded on empirical research which argues “that transition between childhood and adulthood cannot be achieved without substantial adjustment of both a psychological and social nature” (Hendry et al., 1993, p. 9). Erikson and the psychoanalytical model proposes adolescence as a time of ‘storm and stress’, what Farrelly (1994) termed a ‘traumatic time’ and the individuals going through it as ‘volatile’. Erikson recognized the search for ‘self’ and saw the crisis of adolescence proposed within the storm and stress model as a potential ‘turning point’. Building on Erikson’s model, developmental contextualism was theorised by Urie Bronfenbrenner and Richard Lerner. Developmental contextualism is associated with the life-course perspective which takes into account the ecology or context of human development, timing, continuity of development and reciprocity and agency. Focal theory has close associations with developmental contextualism, and thus has association with the social-ecology model of resilience. Additionally, it further explores the timing of specific issues that ‘come into focus’ for adolescents at different ages and the premise that, by focusing on one such issue at a time, adolescents may cope with the change inherent in adolescence. Focal theory shares much with the work of Erikson and Bronfenbrenner. For example, the notion of stage development is present in Erikson’s as well as Coleman’s model, but Coleman also takes into account the potential when multiple issues are being addressed simultaneously for some young people. Focal theory holds particular relevance with regard to young people ageing out of care, as they have to undertake dual, highly-stressful processes simultaneously. They must make the transition from childhood to adulthood at the same time as the transition from care to independence in circumstances that are ‘both accelerated and compressed’ (ibid). The need for time and space to process these changes becomes evident when considered from the focal theory perspective and when recognition of the impact of stress is taken into consideration. According to focal theory, young people focus on one issue at a time and, given that there is, potentially, considerable stress present in the life of a care leaver, it is possible that, in these circumstances, the one issue may be the stress associated with the process of leaving care. This may be the anxiety invoked by the impending loss of relationships, familiarity and security (Dixon, 2008; Holt & Kirwan, 2012). It is important to bear in mind that children who enter the care system have often experienced trauma in their lives both prior to entry into care and within the entry process itself and these traumas may be re-experienced (Stein & Dumaret, 2011). Failure to facilitate the time and space required to process successfully such experiences and the stress which they induce can result in the young person becoming overwhelmed or, within Maslow’s hierarchy of needs context, ‘blocked’ and unable to progress beyond the present level of functioning. Furthermore, times of transition are oftentimes identified for human beings as times of upheaval and vulnerability with the individual’s psychological coping capacities consumed with managing the present stress, thus rendering them vulnerable to being overwhelmed by additional stressors. These additional stressors can occur in the form of new issues with which to cope or the emergence of issues which had remained dormant until this time. Therefore, the level of functioning at which the care leaver is ‘stuck’ may reflect these stress-induced factors and be lower than if they were not present. Whilst this can add to the burden of coping for young care leavers it also represents an opportunity to focus on an issue which may be of profound significance for the care leaver but has not been within their ‘focus’ for some time. It may have been suppressed but is now brought into focus due to the psychological agitation induced by the transition process and healthy psychological development may be both restored and promoted by seizing the opportunity and addressing this issue. This strategy is supported by the psychodynamic conception of adolescence, especially that espoused by Anna Freud (1958) and Peter Blos (1962), which, inter alia, posits that adolescence is a second, and sometimes last, opportunity to address unresolved childhood issues. These issues, if not resolved, thereafter become fixed as internalised unhealthy blueprints for adult functioning and deeply-entrenched psychologically, thereby becoming rendered more inaccessible for therapeutic resolution. Therefore, by alleviating the stress in the life of the care leaver with targeted interventions and by discerning what issue comes into focus within the vacuum created by the removal of the stress, the opportunity may become available to resolve childhood trauma. These issues may be unresolved and formerly suppressed but now become manifest within the opportunity presented by the crisis of transition, where the emotional and psychological crisis-induced tumult creates psychic fissures through which these issues may rise to the surface. It has been my observation over my years in residential care that, both within staff teams and resident groups, vacuums do not last long as people, consciously and unconsciously, jostle for roles within these groups. Similar psychological processes may well be at play within the transition process for individual care leavers. It allows the care leaver to resolve the current issue and move beyond this to the next issue thereby promoting healthy psychological development. This may be a ‘turning point’ for the care leaver (Hannon et al., 2010) as the issue which arises may be one which has been ‘blocking’ their healthy psychological development for some time and by resolving the issue new developmental pathways may become open. From a similar perspective of disruption to normal psychological development, the potential harm to children in care who are subjected to multiple movements between placements can become manifest when considered from a focal theory perspective. Focal theory is strengths-based and client-centred and focuses the practitioner’s attention on the here and now of children’s lives. This is important when we consider the propensity for outcomes, risk and other currently dominant paradigms to focus on future events while other approaches and therapies, such as attachment and trauma, look at the past and that this can often be at the expense of the child’s right to quality of life in the here and now. Their daily life is affected by a range of assessments, therapy sessions and programme goals to be met, meaning that their need – and their right – to lead a ‘normal’ daily life may not be met. The world is changing at an unprecedented pace and this is impacting on young people more than any other age group. Globalisation, unemployment and ruptured pathways to adulthood have all added risk and uncertainty to the lives of today’s young people in a way that I did not have to experience to the same extent at their age (Bryner et al., 2002). The search for security has become preoccupying yet elusive in an incessantly changing and risk-defined world with ever more porous borders, but for young people, this is magnified (Pinkerton, 2012). The impact on young people’s search for identity, an issue at the core of all young people’s development (Erikson, 1980), but particularly complex for young people in care who may have fractured family and community life histories, is profound within such undefined futures. Here, as Stein (2006) has said, we must remember that care leavers are first and foremost young people and impacted by the same previously mentioned forces that affect all young people. However, care leavers have the additional disadvantage of having been exposed to trauma in their childhoods, having been in care and, on leaving care, being at risk of social exclusion. For care leavers, these forces are both magnified and multiplied when they are also experiencing transitions that are ‘accelerated and compressed’(ibid). Concurrently, and paradoxically, at the very time of major vulnerability when they most need the stability and security of significant attachment figures, care leavers experience broken relationships and attachments as a result of having to leave care staff behind (Holt & Kirwan, 2012). If we accept the assertions of eminent theorists such as Anna Freud and Erik Erikson who posit that adolescence is the second, and sometimes last, chance to address the crises of earlier childhood, then aftercare can be seen to represent the second, and last, chance to address the crises of negative in-care and pre-care experiences. Failings of the state to support and protect these children adequately, thereby missing this opportunity, represents the gravest of failures. It is the state’s last opportunity to right many of the wrongs perpetrated upon these young people. Endings and beginnings are intertwined, so eloquently put by T.S. Eliot, and for these young people having a positive ending to their care experiences can facilitate positive beginnings in their adult lives – but unfortunately, the converse is also true. Tags: developmental contextualism, transitions; focal theory; independence; loneliness; interdependence; residential child care; leaving care; aftercare; stress.